Most investors tend to think that hedge funds and other asset managers are worthless, as they cannot beat even simple index fund portfolios. In fact, most people expect hedge funds to compete with and outperform the bull market that we have witnessed in recent years. However, hedge funds are generally partially hedged and aim at delivering attractive risk-adjusted returns rather than following the ups and downs of equity markets hoping that they will outperform the broader market. Our research shows that certain hedge funds do have great stock picking skills (and we can identify these hedge funds in advance pretty accurately), so let’s take a glance at the smart money sentiment towards UDR, Inc. (NYSE:UDR). Is UDR, Inc. (NYSE:UDR) a buy here? Money managers are turning bullish. The number of bullish hedge fund bets advanced by 4 recently. There were 16 hedge funds in our database with UDR positions at the end of the previous quarter. 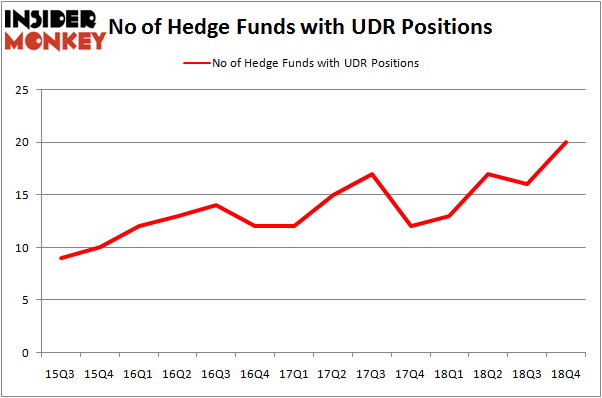 Overall hedge fund sentiment towards UDR is currently at its all time high. This is usually a bullish indicator. For example hedge fund sentiment in Xilinx Inc. (XLNX) was also at its all time high at the beginning of this year and the stock returned more than 46% in 2.5 months. We observed a similar performance from Progressive Corporation (PGR) which returned 27% and MSCI which returned 29%. Both stocks outperformed the S&P 500 Index by 14 and 16 percentage points respectively. Hedge fund sentiment towards IQVIA Holdings Inc. (IQV), Brookfield Asset Management Inc. (BAM), Atlassian Corporation Plc (TEAM), RCL, MTB and CRH hit all time highs at the end of December, and all of these stocks returned more than 20% in the first 2.5 months of this year. In today’s marketplace there are a lot of signals stock traders use to value publicly traded companies. A pair of the less known signals are hedge fund and insider trading indicators. Our researchers have shown that, historically, those who follow the best picks of the top fund managers can beat the S&P 500 by a solid margin (see the details here). We’re going to take a glance at the fresh hedge fund action surrounding UDR, Inc. (NYSE:UDR). What does the smart money think about UDR, Inc. (NYSE:UDR)? At the end of the fourth quarter, a total of 20 of the hedge funds tracked by Insider Monkey held long positions in this stock, a change of 25% from the previous quarter. Below, you can check out the change in hedge fund sentiment towards UDR over the last 14 quarters. With the smart money’s positions undergoing their usual ebb and flow, there exists an “upper tier” of key hedge fund managers who were upping their stakes substantially (or already accumulated large positions). Among these funds, Renaissance Technologies held the most valuable stake in UDR, Inc. (NYSE:UDR), which was worth $431.3 million at the end of the third quarter. On the second spot was Zimmer Partners which amassed $165.4 million worth of shares. Moreover, Millennium Management, Adage Capital Management, and Stevens Capital Management were also bullish on UDR, Inc. (NYSE:UDR), allocating a large percentage of their portfolios to this stock. As industrywide interest jumped, some big names have been driving this bullishness. Zimmer Partners, managed by Stuart J. Zimmer, assembled the biggest position in UDR, Inc. (NYSE:UDR). Zimmer Partners had $165.4 million invested in the company at the end of the quarter. Matthew Tewksbury’s Stevens Capital Management also initiated a $4.9 million position during the quarter. 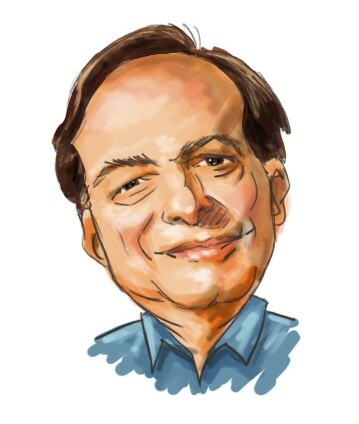 The following funds were also among the new UDR investors: Ben Levine, Andrew Manuel and Stefan Renold’s LMR Partners, D. E. Shaw’s D E Shaw, and Ray Dalio’s Bridgewater Associates. Let’s now take a look at hedge fund activity in other stocks – not necessarily in the same industry as UDR, Inc. (NYSE:UDR) but similarly valued. We will take a look at Mid America Apartment Communities Inc (NYSE:MAA), Atmos Energy Corporation (NYSE:ATO), Arch Capital Group Ltd. (NASDAQ:ACGL), and Universal Health Services, Inc. (NYSE:UHS). This group of stocks’ market caps are similar to UDR’s market cap. As you can see these stocks had an average of 21.75 hedge funds with bullish positions and the average amount invested in these stocks was $576 million. That figure was $669 million in UDR’s case. Universal Health Services, Inc. (NYSE:UHS) is the most popular stock in this table. On the other hand Arch Capital Group Ltd. (NASDAQ:ACGL) is the least popular one with only 13 bullish hedge fund positions. UDR, Inc. (NYSE:UDR) is not the least popular stock in this group but hedge fund interest is still below average. This is a slightly negative signal and we’d rather spend our time researching stocks that hedge funds are piling on. Our calculations showed that top 15 most popular stocks among hedge funds returned 19.7% through March 15th and outperformed the S&P 500 ETF (SPY) by 6.6 percentage points. Hedge funds were also right about betting on UDR, though not to the same extent, as the stock returned 14.8% and outperformed the market as well.